The Witch's Island: Shiny New Pots! It’s been awhile since I’ve written about money issues but this week I’m going to tell you how we saved ourselves $600! You may remember awhile back that I mentioned receiving an inheritance from a long lost relative. At that time we decided that we would buy a piece of original artwork from the money so that we would be able to remember receiving this gift for many years. Well, it turns out that there were more assets in Eric’s estate that needed to be distributed and so; we will soon receive another small amount of money. The question was how to use this in such a way that we would think about him and what he had done for us. We’ve had the same crappy old set of cooking pots for over 30 years. It’s been this mismatched amalgamation of an old set from Sears and 2nd’s from factory outlets in the States that my Dad bought for us. We also had a few extra pieces we picked up here and there. The lids of some of the pots had started to crack off years ago. Hubby has had to reattach them using various methods including hot melt glue (not advisable) and epoxy. It was embarrassing for us to let anyone see them and we have wanted to replace them for a long time. What a perfect way to use Eric’s money! So I started to research different cookware manufacturers. I was looking for both high quality and Canadian manufacturing. 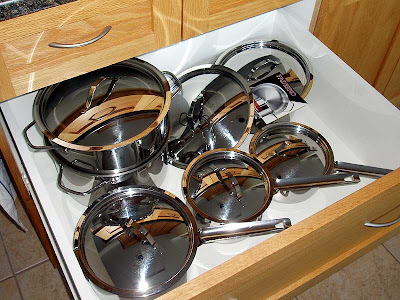 There were not too many manufacturers that fit this set of requirements but Paderno soon rose to the top of our list and we began to look for stores to buy them from. Last weekend we spent a whole day crawling every kitchen supply store on the Witch’s Island looking at pot sets. Have you any idea just how few pots available in our stores are actually made in Canada? Not many, is the short answer. Paderno sets were particularly hard to come by and we ended our shopping experience by deciding to do some more research. 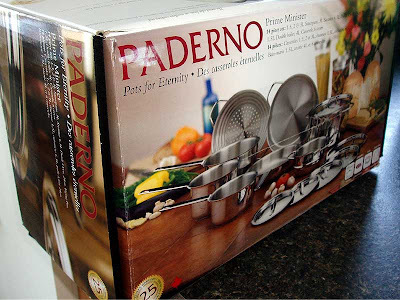 While on the internet I decided, just for fun, to look at some used goods sites and to my great surprise, I found someone who was selling a set of Paderno pots for $500! The set she was selling is listed on Paderno’s website for a staggering $899! On top of that they had apparently never been used and were still in their original box. What kind of crazy person spends this money on pots and doesn't use them? Apparently, someone who receives them as a gift and who already owns a set. I decided that I would try and get even more of a bargain. 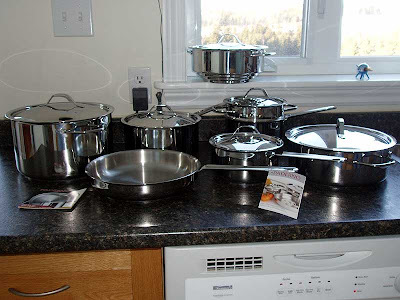 So, I called and told the woman that I was looking for a Paderno set but I only had a $300 budget and would she consider this amount? I was amazed that she said “yes”. I even said it again that I could only spend $300, okay? She agreed again and the next day we traveled all the way to the Big City to see the pots. They were exactly as advertised, still in the box, still wrapped in plastic and still with their original price tags in place! Wow, we grabbed them and ran, thinking that there had to be a catch somewhere. We even had to stop in a Timmy’s parking lot to count all 14 pieces just to make sure. They were all there; my faith in humanity is restored! All we have to do now is sell off the old stuff at a yard sale this summer. The “Urge to Purge” will be the theme! Thank you, Eric. After all the excitement of bargain pots, we went to the Village to look for some bargain clothing. I found some great stuff there, too. 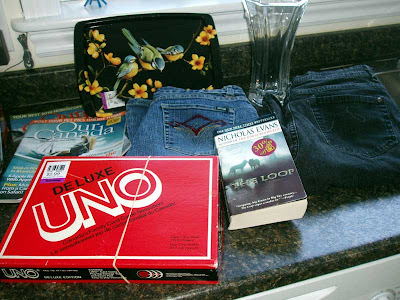 I got two pairs of jeans, a game for next weekend’s “Game Night” and a flower vase to replace the one Hubby broke last year while “dusting”. I bought this all with the last of my Christmas gift certificates meaning no money out of pocket. The vase is “Hoosier” glass and it weighs a ton so it’s not going to tip over, easily. I can hardly wait to put some flowers in it. Hubby, are you paying attention? Then it was on to grocery shopping. Why, oh why, do we go grocery shopping at the busiest grocery store on Witch’s Island at the busiest time of the week? We had to line up just to get down each aisle. Then we had to wait for almost twenty minutes at the checkout line. Hubby was set to blow and swears never to go back to this store again, we’ll see. We did get some good buys, though. 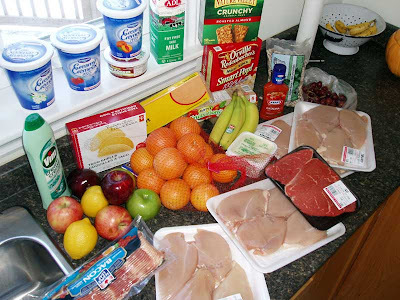 We spent $100.02 on all the stuff you can see in the pictures but $40 of that was for the chicken which we split into 8 two breast packs. That’s enough for eight different meals for us so it was a real bargain. All in all, it was a very successful shopping day. I love your new pans--And good for you for finding such an incredible bargain on a entire set!!! I'm sure you were over the moon with such a good deal--I would have been excited too!! I've been slowly replacing my pans and know what the cost is for good ones. I've also been getting the glass lids, and I really like them as well. I love Love LOVE my set of Paderno pots that I got in January 2008... they were on sale on the website and delivered to the door it was quite a bargain (around $200 I think). I only got about half the amount you got though, and I love your skillet (mine is coated with non-stick, I'd rather have one like yours). You won't ever see the end of them!! Good deal on the chicken, I stocked up too... chicken is so versatile, I need some in the freezer at all times. Game night sounds like fun!! Paderno products rock, and you got a sweet deal! I was wondering why you didn't snag them when they have their warehouse sales? But, I think I get it now, no tax! Sweet! PS, love you finds at VV. I bought chicken too, just like you and CS! Wow..incredible deal and very VERY nice pots...now I'm looking at MY crappy old pots and thinking....but new pots will have to wait till after we move to Japan next year. My mother always had very good pots and come to think of it she has had the same set since we were kids...very well made sturdy set. Have fun cooking in them!! I have one small paderno pan and one very small frying pan from paderno....aren't they made in PEI? I believe that Paderno pots are made on PEI. Here on the Witch's Island we do our best to support the economies of other Islands, everywhere! 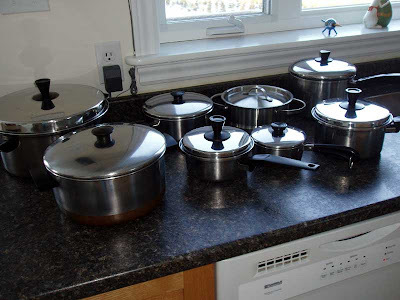 I finally got the url to work (it's a long, boring story) but those pots look beautiful. I think I am going to like mine too. Right now they're not in use because I have to admire my purchases for a while before I use them - silly, I know, but I think they're pretty!